Gram Book 1 – This design is unusual and not hard to cut. The P3 & P4 facets are a different size which gives the stone a very different flash. 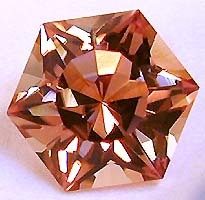 P4 facets cut very fast so watch out, 1/2-4cts any color med to light material. This design is surprisingly nice, give it a try… Cut in refractive index 1.62 to 1.93 (77.5%) with no changes.